The film, seen late last year on Showtime cable, is now opening theatrically. It strips Coppola bare of all defenses and yet reveals him as a great and brave filmmaker. It also reveals the ordeal he put his actors and crew through, on location in the Philippines - and what he endured at their hands. We see a drunken and bloodied Martin Sheen improvising a breakdown while the room is charged with the possibility that he will attack Coppola or his camera. Sheen being given first aid after a serious heart attack. And Coppola screaming in outrage that Sheen's condition has been leaked to the trade papers and the news could pull the plug on the production: "Even if he dies, I don't want to hear anything but good news until it comes from me." In other passages, Dennis Hopper, his mind adrift on drugs, is unable to remember his lines and yet somehow improvises brilliantly. Marlon Brando, at $1 million a week, turns up without preparation and engages in endless debates with Coppola about his character. Brando begins one scene and then wanders off while the camera is still running, mumbling, ". . . and that's all the dialogue I can think of today." "Apocalypse Now" premiered in 1979 at Cannes, shared the Palme d'Or, and went on to become one of the great mythic productions in film history. It told a story about Vietnam that was inspired by Joseph Conrad's novella "Heart of Darkness," about a journey up the Congo River in search of a man named Kurtz. In the film, Sheen commands a Navy patrol boat that penetrates a Vietnamese river in search of Colonel Kurtz (Brando), who has set himself up as the god of a tribe of jungle Indians. "Apocalypse Now" is one of the greatest films ever made, and legends have grown up around it. Coppola, at a tumultuous press conference at Cannes in 1979, famously said, "My film is not about Vietnam. My film is Vietnam." He also confessed he did not think the ending worked. Now we see what he was talking about. The script, written by John Milius and originally set to be directed by George Lucas, went through so many changes that finally Coppola was writing it as he shot it, and actors were improvising. The production was bedeviled by monsoons, huge cost overruns, health problems, and logistical nightmares, as when the Philippine government of Ferdinand Marcos tried to rent Coppola the same helicopters it was using to fight rebels ten miles away. Brando put Coppola under enormous pressure by turning up without having read "Heart of Darkness," and refusing to be shot except in shadow. And Coppola, in conversations he did not know were being recorded, shouted in despair to his wife, Eleanor: "I tell you from the bottom of my heart that I am making a bad film." And again, "We are all lost. I have no idea where to go with this." Yet Coppola's vision somehow remained secure. Milius, flown to the Philippines by a desperate United Artists to try to bring sanity back to the script, remembers that he walked in prepared to convince Coppola that the war was lost and they had to salvage what they could. After 90 minutes, he says, "Francis had me convinced this would be the first film to win the Nobel Prize." 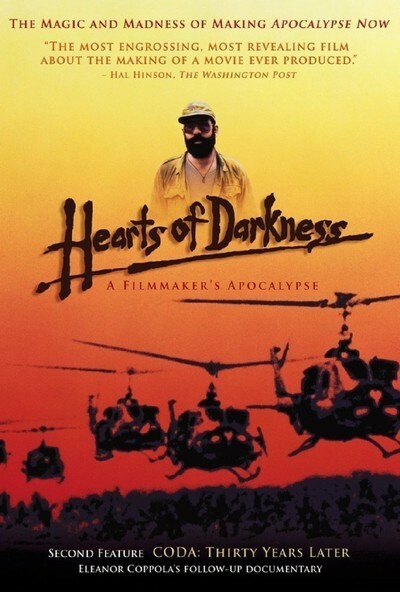 "Hearts of Darkness," written and directed by Fax Bahr and George Hickenlooper, is based on documentary footage that Eleanor Coppola shot at the time, and on recent interviews with both Coppolas, plus Milius, Lucas and actors Martin Sheen, Frederic Forrest, Robert Duvall, Dennis Hopper, Timothy Bottoms and Laurence Fishburne, who incredibly was only 14 when he played one of the patrol boat crew. Eleanor's secret tape recordings were also made available, and the result is fascinating, harrowing film history. We feel for once we are witnessing the true story of how a movie got made.